Living with metastatic breast cancer is strange and hard and overwhelming. Like families across the country we are getting back into the swing of school, homework and activities. The boys are nervous about their new school, excited to see old friends and enjoying soccer, chess club and playdates. I am working like crazy at Hope Scarves – planning our fundraiser on September 26th, creating a new ambassador program, public speaking, coordinating volunteers and scheduling requests for promotional appearances leading up to “Pinktober”… and that was just yesterday. Jay is working in Finland this week – a monthly trip he used to make regularly before stage 4 and my parents are in town to lend an extra hand. By all accounts our life looks normal and happy. And it is… but it’s not. I have to sit on hold for an hour with the cable company, break up brotherly fights, fix flat tires and wash dishes – just like everyone else. But, in between the “normal” I research organizations looking for a cure to metastatic breast cancer, follow blogs about people living with this disease- most of which are having a much harder time than me or are further along in the journey and taking really awful drugs that are in my future and it scares me terribly. I read the memorials families post about women who have died from my same disease – gorgeous smiling moms hugging their children in happier times. I send cards to loved ones left behind and look back at emails from a friend who I met through METS and died last week. I look over her emails of encouragement to me and wonder at her hope and determination in the face of this disease… wondering with overwhelming fear what my future holds. Then, I help figure out the difference between a rhombus and a parallelogram, I clean up puppy puddles and look for lost soccer shin guards. It’s really strange… living like this. But, I am living! I yearn for happier times over the past 6 years. For days when I was just creating Hope Scarves, running 6 mile trail runs, volunteering in our safe happy preschool, happily planning adventures together with my boys, laughing with friends, drinking good wine and just loving life. I miss the chubby little hands of our sons in mine and their needing me to cut up their food or kiss boo-boos. I miss stressing over lost sunglasses, tennis matches and mismatched socks. I miss spending hours running around town doing errands for meaningless things that at the time seemed very important… I miss going about my day without fear and sadness. So, they call this the “new normal” and I am embracing it. I can’t change that I have stage 4 cancer. But, I can control the way I deal with it. I am learning to live in this crazy, scary new reality. Laughing and chit-chatting at parent teacher night one minute, crying in the hallway the next. It isn’t normal, but it’s our life now. I have an appointment with my oncologist this week and my monthly injection. Then, he will schedule my PET scan for late September. In the meantime I will continue to figure out how to balance this crazy reality we are living in. Laughing/crying… celebrating/mourning. And, always hoping. ALWAYS Hoping! 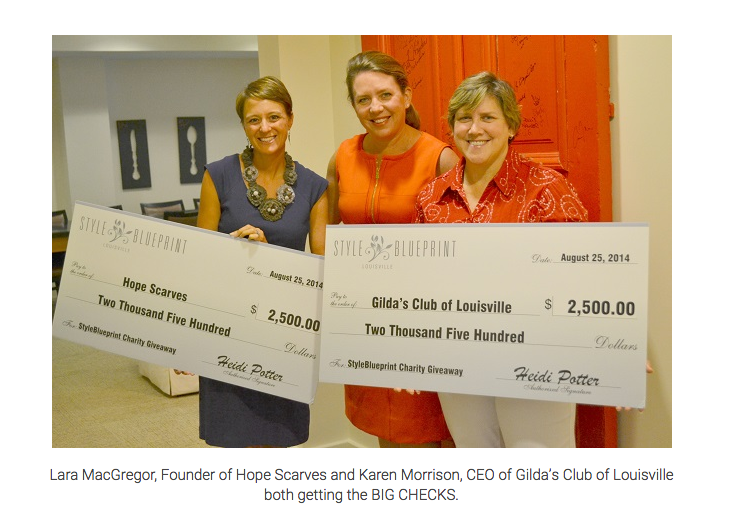 After weeks of competition and thousands of votes, Hope Scarves & Gilda’s Club split the StyleBlueprint Louisville Charity Challenge award. The money will be used to support combined programming between the two organizations. Click HERE to read the full story! Our family returned to ky this week after 8 amazing weeks in Michigan. Like we do each summer- we spent time with family and friends in the upper peninsula, petoskey, white lake and fish lake. 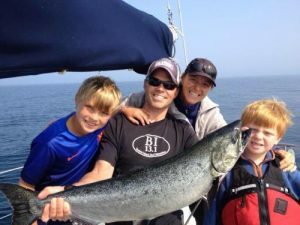 Swimming, fishing, hiking, kayaking, eating delicious meals, laughing, sailing, playing on the beach, picking blueberries and so much more. It was like all our other summers in Michigan on the outside- better even! This year we decided to rent our own cottage and were blessed to call our yellow cottage on the top of a Lake Michigan sand dune home for a month! It was an amazing place where I stayed on my own during the week with the boys and jay visited in between work trips. I loved being able to keep up with the boys and just be their mommy! Every day was an adventure. And I could do it all- climb sand dunes, paddle board, swim across my grandma’s lake, trail run with my best friend from high school! I was able to relax about as much as you can with 6 and 9 year old boys on vacation. Maybe I should better say, I was able to fill up our days with fun and over extend myself like I love to do! There was an enormous amount of comfort in knowing that in the time we had there I would most likely be healthy. I knew I had this summer. And I made it all I could. 4,500 pictures to prove it. I sailed on Lake Michigan every chance the wind was right, I rarely missed a sunset, I drank good wine and cherished hugs with old friends. I snuggled the boys in the morning – getting out from our cozy bed just in time to make 10am Swim lessons. You could say we packed a lifetime of fun into this summer. Simply spending time with my three boys and making memories. I lived my life – instead of worrying about what the future held. Because I knew we had this summer. Now we are back to reality. Back to living with metastatic breast cancer… Whatever that means. Back to the bed where I felt so sick and desperate this winter. Back to living with the unknown of what will come next or how long my current treatment will work. I have some side effects, but for the most part I can live my life. Yet, I am paralyzed and sad making the adjustment back to reality. Maybe it is some typical post amazing vacation blues, nerves to be starting a new school…but more so it is simply living in the uncertainty and knowing my body is not “well” that I can’t stand. I was able to just live in the moment this summer, but for some reason-here I feel like a patient again. Because, well, I am. I can’t escape it – I have stage 4 breast cancer. A terminal illness. So, I proceed into a new school year with all the same joys and apprehensions of my other mommy friends. Trying to be “normal” when my fears and anxieties are so much deeper than I can explain. We will take the back to school pictures and kiss our kids good-bye and we will start the next chapter of this journey. Wishing we had a plan, some idea of what will happen for our family or better yet a cure. Wishing we could set our sights on an end to treatment or prepare for a procedure that would take care of this. I have a PET scan in September – which will show us what the cancer is doing. If there is no sign of progression we will stay the course. If there is, we will adjust my medicine and hope we can find something to control it. I am working full time at Hope Scarves – planning our annual fundraiser for Sept. 26th (purchase tickets at www.hopescarves.org), Excited to see our organization grow and gain momentum in supporting women with cancer and I am focusing on making my body as healthy as possible – good nutrician, exercise, laughing, reducing stress, etc… I am planning a “back to school” trip to the beach with friends, Chicago with my God daughter and skiing this winter. All the time knowing things can change at any time. But, also that I want to have as much fun as i can for as long as I can. Thank you for following our journey with stage 4 breast cancer. Hopefully my posts will continue to be of living life to the fullest and joyful adventures. But there are no guarantees. One thing we do know… we’ll always have this summer. I saw a story about Hope Scarves on Facebook shortly after I was diagnosed with cancer and shared it with my friends and family. After I shared the story, several of my friends and family members sent scarves to me. 2. If you donated a scarf please share what this experience meant to you or if you received a scarf and story please share how this impacted your healing journey? I have received 4 scarves from Hope Scarves since beginning my journey in April. Each of my chemotherapy cycles consist of an inpatient treatment, where I receive IV and IP chemo, and an outpatient treatment, where I receive only IP chemo. The inpatient treatment makes me feel the worse – I usually end up on the couch for several days after each one. It is really hard to have to tell my kids I can’t do things with them because I am sick, or to have to miss their ball games. It is during this part of my treatments that I feel discouraged and depressed. Fortunately, my scarves have all come during these times. The stories that accompany the scarves have given me hope and helped to lift my spirits. It is so encouraging to know that all of these other women have been through something similar and have come out of it so strong. Whenever I feel myself losing hope, I think about their stories and know that if they can do it, I can too. For me, my support system has been a major source of strength. I have a big family and they are always ready and willing to help me in whatever way they can. I also have a big church family that has been praying constantly and providing encouragement throughout my journey. I am currently in the middle of my chemo regimen. I am in the middle of my third cycle and I have to complete six cycles. I am trying to live life as normal as I can by spending time with my kids and my family and doing fun things around town in between cycles. We had to cancel our Gatlinburg vacation this summer, but are planning a beach trip to celebrate the end of my chemo in October. I wish other people knew how much of a difference Hope Scarves makes in cancer patients lives. 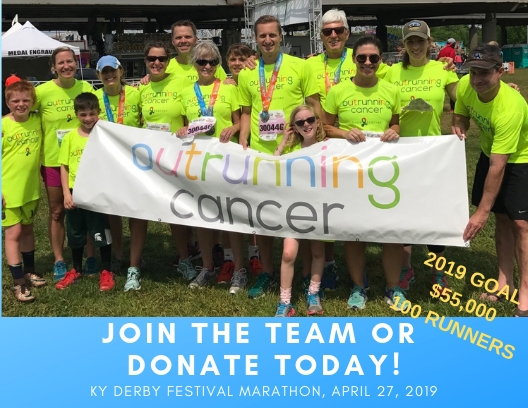 Without going through it, it is difficult to understand just how hard battling cancer can be and how simply hearing someone else’s story and knowing other people are going through the same thing can completely change your outlook. I would encourage them to do it. The person they are sending it to may be discouraged and the scarf will definitely lift their spirits and give them strength to keep fighting. I am a paramedic and had started a paramedic to RN bridge program before I got sick. I plan on finishing the program and becoming an RN. I also plan on finding a way to give back to other cancer patients and encourage them on their journeys. I have been on both sides, going through ovarian cancer myself and losing my sister to Ewing sarcoma 5 years ago. The big thing that I learned is to not take life for granted. Everything can change in the blink of an eye, so don’t waste time holding grudges or being angry or worrying about things that don’t really matter.